DashThis is used by digital marketing agencies (both small boutique firms and large multinationals), various SMBs, as well as several internationally recognized brands. 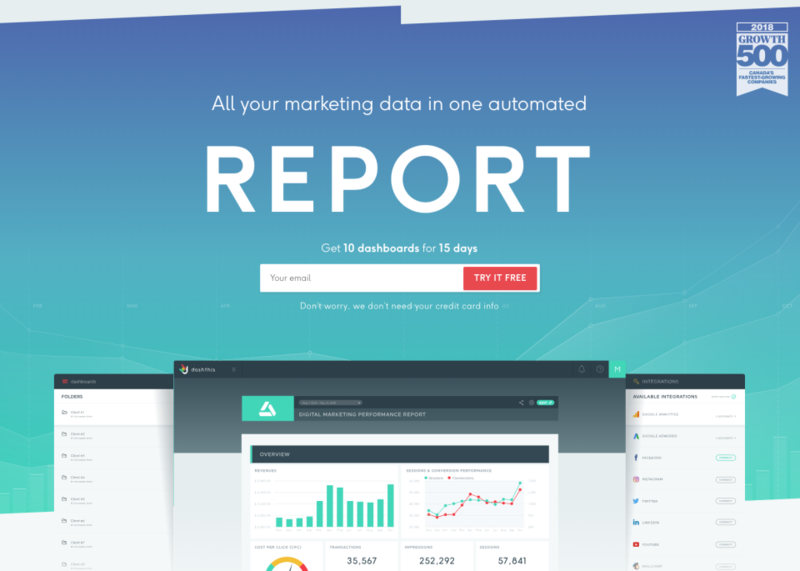 DashThis helps digital marketers and agencies everywhere by providing an awesome, easy-to-use and attractive dashboard tool so that marketers can stop wasting time gathering data, and instead do what they do best: make decisions based on that data. Pros: They have the greatest customer support. Very personal and quick. Not the typical short answers where you're left "alone" with the problem with some forum link. Cons: Editing widgets can sometimes be tricky and you need to start from scratch sometimes with some widgets but they are changing this fast. Pros: With a little big of learning (which my rep was SO helpful with), this software is pretty much plug and play for great dashboards with all kinds of customizable metrics. It makes my monthly reporting tasks for paid advertising with multiple accounts MUCH faster. The company can white label a report format for you as well, which takes that customization up a notch. Cons: Some of the features that shouldn't necessarily qualify as "advanced" (selecting specific campaigns to report on) aren't so user-friendly. The date selection features could use a little work (i.e. I don't want to have to create a whole new report just to report on a date range outside the norm) and sometimes the changes to editable content (like notes) doesn't populate in the pdf without going to the home screen first. Overall: Streamlined weekly reporting process saving hours of my time. Pros: Love the ease with which you can drag and drop widgets to create your custom report. Aldo the ability to have a living breathing reporting URL for clients. Pros: The best thing about this software is how easy it is to use with its drag and drop feature and how you can customize your own templates to import metrics that you need for each client. Cons: I cant really say anything that I likes the least about this software. It worked well for me, but my company transition away from it because we wanted to be able to add pictures and text for more in-depth reports. Pros: DashThis is a very accommodating, flexible tool: we have a lot of control over layout, chart/graphic type, etc so we can really customize our client marketing reports. The number of data sources it integrates with---AdWords, Bing Ads, Google Analytics, Facebook Ads, etc---reduces our time to create live data reports. Overall: DashThis significantly decreased the labor we spent creating custom marketing reports, while increasing the usability and clarity of data. Economist with specialization in Administration and Marketing. Pros: DashThis is easy to use, integrates with many advertising platforms, saves many hours of data collection that you want to show to customers. Fairly easy tool to use with great capabilities for reporting. Customer service is fantastic. Pros: We've been using it for social media reporting and have found it to be a great tool. It is easy to set up and design dashboards for reporting, and when we have had questions, customer service has been extremely responsive and helpful. Pros: Ease of use. Great looking final dashboards. Monthly emails to clients. Dash This is just a great help... saves me loads of time creating presentations of information. Cons: So much functionality, sometimes I forget how to find certain things. Otherwise I have no complaints. Overall: Saves time. Easy to use. Fantastic looking dashboards. Automatic monthly client emails. "Makes dashboarding fun" - this just made our day! Glad we could bring a little fun to what might otherwise be a dull process! Perfect! Where has this been?? Pros: This just made my life so much easier. In less than an hour, I was able to set up a complete marketing dashboard with all of my key integrations. It was super easy. Cons: I wish I could integrate my Birdeye software so I can also monitor online reviews, but I understand they can't integrate with everything. Overall: Great! I highly recommend. Pros: Loved the overall look and feel of reports. We were disappointed that the features didn't work out for us, because the branding and overall layout was great. Cons: Didn't clearly show month to month comparisons. Didn't provide demographic data of fans/followers. Didn't include post previews (just text). The "Summary" feature was lacking. Pros: Good point and click marketing analytics platform. Easy to integrate several different platforms. Saves a ton of time. Cons: Product isn't much more of a more user friendly Google Analytics platform.. You can accomplish the exact same platforms by integrating your data sources into Google's Data Studio (Free). I use DashThis to view metrics for the social platforms that I manage and it is very easy to use. Pros: Easy to read metrics and numbers. The data can be communicated and prepared with minimal doing on my part. Cons: Sometimes there can be a little bit of confusion has to how the numbers are measured and it just takes a little bit of digging to learn. Can be tedious. Overall: The ability to show my clients that our work is helping their business.